Singer, songwriter, producer, Jamie Alimorad first hit the stage as a solo artist in the underground Boston club scene in 2009. The following year he graduated from Northeastern University with a music technology degree and released his first EP Cornerstone. Jamie Alimorad considers first recorded tracks: “What You Have,” “She Is. . .,” “Stay With Me” and “In Her Smile,” to capture his musical essence. All four songs peaked at #1 on the Indie104 Top 40 chart in 2011. The power ballad “She Is…” went on to become the most-played song in the history of iRadio LA, the world’s longest-running, independent music station. Cornerstone gained Alimorad not only radio presence but also a fan base across the country, prompting a bicoastal tour including performances in Boston, New York, Washington, D.C., Phoenix, Las Vegas and Los Angeles. The tour ended with a return to the studio, where Alimorad recorded twelve new songs for his highly anticipated, first full-length album Words Left Unsaid. The album released in July 2012 to rave reviews, which catapulted Alimorad to sold-out, marquis performer status in Hollywood’s premiere venues like the Troubadour, Whisky A Go-Go, and the Roxy. 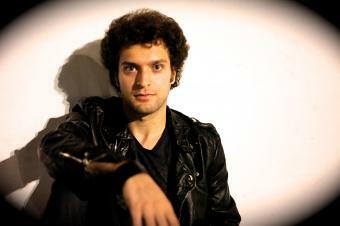 The lead single “Dancing With You” followed the success of the first four tracks, landing Alimorad back on the top of indie music charts. The fan-favorite, tongue-in-cheek second single “That’s What She Said” hit the IMC Top 10 chart, where it stayed for four months, topping it at #1 for six weeks. The popularity of these two songs and others turned Alimorad into the most demanded artist on indie radio stations based out of Los Angeles, Las Vegas, Minneapolis, Detroit, Philadelphia, and Miami. He was also nominated for the 2012 Hollywood Music In Media Awards (Best Rock Song: “Weapon”) and the 2013 Artists in Music Awards for Best Rock Artist and Best Pop Artist. The album’s triumphs in the U.S. started a domino effect of media attention for Alimorad abroad. Both Words Left Unsaid and Cornerstone have been praised by reviewers in print magazines and blogs in the United Kingdom, France, Spain, the Netherlands, Belgium, Germany, Australia, and Canada. Honored by the enthusiastic reaction to his music, Jamie Alimorad is eager to continue giving his fans his music, his passion, his all. •	Has performed with Jordan Rudess of Dream Theater.